French Guiana’s Spaceport is busy with activity as preparations advance for Arianespace’s initial Ariane 5 and Soyuz missions of 2018, which will set the stage for up to 14 flights this year using its family of launchers. Riding atop one of two operational launch tables at the Spaceport (left), the Ariane 5 for Flight VA241 nears completion of its transfer to the Final Assembly Building. At right, SES-14 is fueled in the Spaceport’s S5 payload preparation facility, readying it for Flight VA241. 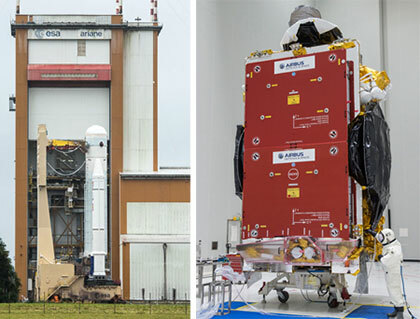 The Ariane 5 mission – designated Flight VA241 in Arianespace’s numbering system – will deliver the SES-14 and Al Yah 3 satellites to geostationary transfer orbit on January 25. As key progress is made for Ariane 5’s year-opening mission, French Guiana also welcomed two of the four passengers for Arianespace’s first Soyuz mission in 2018 – Flight VS18 – scheduled for a March liftoff from the Spaceport. 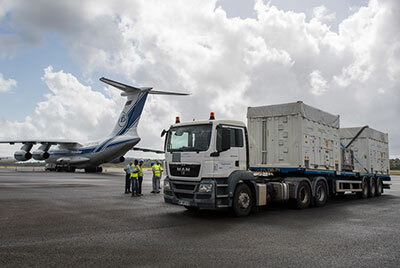 These spacecraft, which will further expand the SES-owned O3b satellite constellation, were airlifted yesterday to Félix Eboué Airport near Cayenne and eventually will be joined by an identical pair, to be delivered later in January. 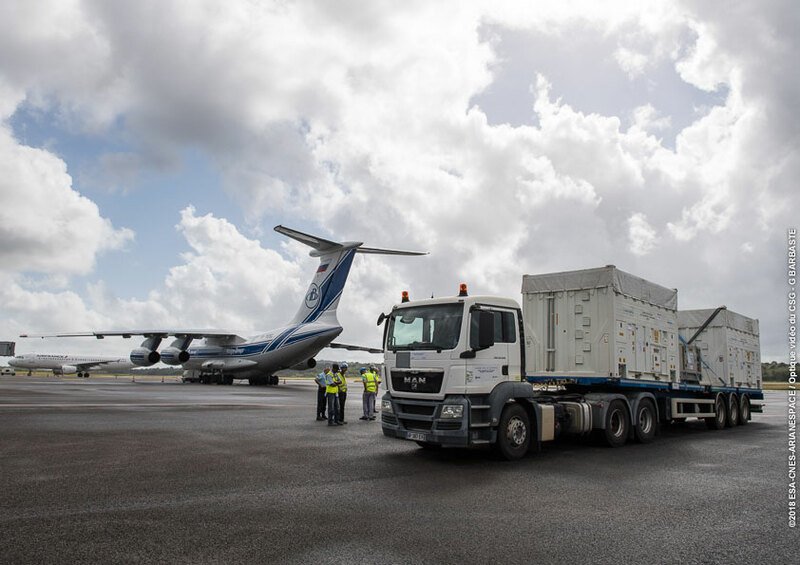 Enclosed inside their protective shipping containers, the two newly-arrived O3b satellites are ready to depart French Guiana’s Félix Eboué Airport near Cayenne for the road trip to the Spaceport. SES’ O3b network offers a system that combines the reach of satellite with the speed of fiber – providing customers with affordable, low-latency, high-bandwidth connectivity. The constellation is fully-scalable to meet market demand and operates from a medium-orbit altitude of 8,062 km. All O3b spacecraft have been designed, integrated and tested by Thales Alenia Space. Arianespace’s planning for as many as 14 missions with its full launcher family in 2018 includes up to seven flights with the heavy-lift Ariane 5, up to four using the medium-lift Soyuz and up to three to be performed by the light-lift Vega.